The Iberostar Dominicana is a beachfront all inclusive resort located on the white, powdery sand and crystal clear waters of Playa Bávaro. Surrounded by extravagant, tropical gardens, it sits less than 17 miles from Punta Cana International Airport. Hotel highlights include 506 guestrooms, a large shopping area with supermarket, pharmacy, shops, and ATM, as well as many leisurely offerings for all age groups from nightclubs, casinos, and live shows for adults to activities and programs designed for children and teens. 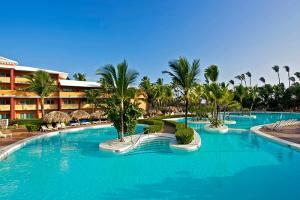 An 18-hole golf course and professional scuba and snorkeling center are also housed at the Iberostar Dominicana. The Iberostar Dominicana, an idyllic local for experiencing true Dominican lifestyle in addition to an unforgettable couple's or family vacation.